Beach to Beach bandeau maxi dress style with elasticated waist and side-leg split. The perfect holiday dress to take you from beach to bar! Beach to Beach sheer maxi dress. All-over mocha print with tie waist detail. Lightweight sheer beach dress perfect for around the pool or cocktails on the terrace. White broderie anglaise beach dress with contrast navy spot belt. Straps can be removed to create a strapless dress. Shirring to back for a secure fit. Fully lined. 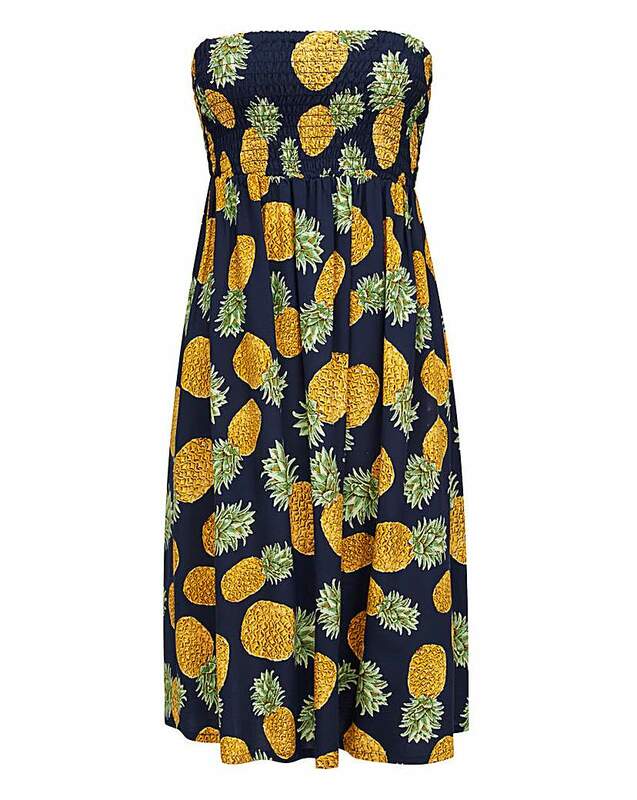 Joe Browns bandeau beach dress in a striking all-over pineapple print. Add some tropical fun to your holiday wardrobe with this beach essential! Sea by Mellisa Odabash brings you the ideal beach cover-up. Maxi dress in a soft viscose jersey. V-neck with gold-trim detail at straps, perfect for throwing over your bikini for that beach-to-bar look. Simply Yours bandeau beach dress. This versatile piece in coral features smocking to the top and frill detail to the hem. Simply Yours Bandeau Beach Dress. This holiday essential in classic white & navy stripe is such an easy shape to wear. Bandeau styling with frill detail to hem, looks great worn over swim pieces from the Mix & Match range. Simply Yours kaftan in classic white with embroidery trims to sleeves and sides. V-neck front and back detailing. The perfect kaftan to take you from beach to bar. Simply Yours soft jersey lime kaftan shape with cut-out back and tie waist detailing.